This shopping list memory game is ideal for practicing the memory techniques used to recall lists. First memorize the grocery list. Then find the items in the store without looking at the list! Wait for the shopping list memory game to load, then click the "PLAY" button on the cash register to start the action. Note: A trolley is known as a "shopping cart" in some countries. If you like this game, you might enjoy the Flipped Out memory card game. HOW TO PLAY. 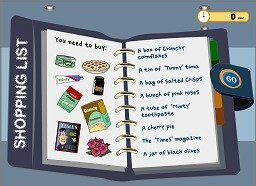 The first thing you need to do in Trolley Dash is spend a few moments memorizing your shopping list. Unless you have a superior memory, I'd suggest you use the Link memory technique, explained below. When you're ready to shop, move your mouse left or right to control the shopping cart trolley. Click on the item you want to buy. If you have correctly chosen an item that was on your shopping list, it will drop into your trolley. Collect all the items on your shopping list to move to the next level. If you forget what's on your list, click on the shopping list to read it again. I highly recommend the Link method for memorizing lists. This method can be used to memorize any kind of information that is in a sequence. If you use the Link method to memorize the list, you won't need to look at the list! Game distributed by Cooking-Games.ws. Used with Permission.